Here’s some serious battle to be won? Are you ready for this? 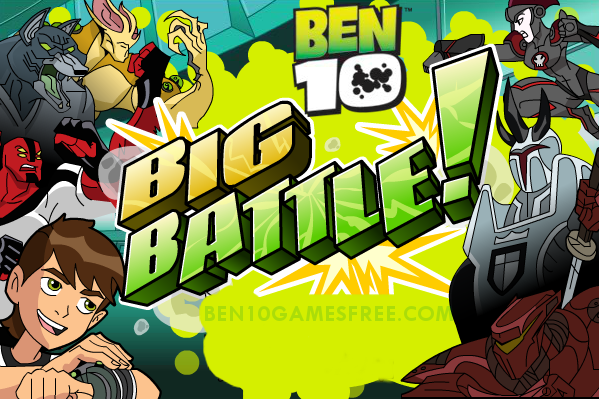 Play Ben 10 Big Battle – an unbelievable online game for Ben 10 fans out there! Help Ben to fight the enemies as you have only three aliens on your side – Biltzwolfer, Four Arms and Eye Guy. Ben 10 Big Battle game is one of the best when it comes to Ben 10 Fighting Games and you surely gonna enjoy playing this game online. Talking about the Ben 10 Big Battle, it begins as Grandpa Max, Kevin, Gwen and Ben enter the yard of Forever King and Rojo’s army is all set to welcome them with future weapons. Fight them and save the day. Recommended for You: Play Ben 10 Alien Swarm Smash Game Online Now! Before you go the battle, let me tell about the Ben 1o Big Battle gameplay. Unlike other Ben 10 Fighting games, in this game who have 3 alien to choose. There are completely insane stages where you will face the army of Forever King and aliens in godowns, streets and even on elevators. The mission of Ben 10 Big Battle is to complete all the stages. In the initial stage, you will only have one alien i.e. Biltzwolfer. The first stage is set in a warehouse and you have beat all the fighters having guns. As you clear the stages, more aliens will be unlocked and you can use them in the stages. Pro Tip: Choose your Aliens wisely, their superpowers can play a crucial role in stages. Like most of the Ben 10 games, you can use the alien superpowers here too. In this game, Ben 10 Big Battle, all three aliens have amazing superpowers that will help you do an insane rampage in the game. Check out the superpowers of each alien in Ben 10 Big Battle Game below. Remember: You can only use the superpowers if the green bar on the top left has sufficient level. To survive in each stage you have two things. First is the Health level which is indicated on the topmost bar on the upper left corner filled with yellow color. Second is the Super Power level which indicated right below the Health bar. The superpower indicator can be refilled by killing more enemies, while to refill Health bar, you have to collect yellow orbs that are hidden in boxes, barricades and rocks and you have to smash them to collect them. So, that’s all you need to know about the Ben 10 Big Battle game. Now go and fight! Clear all stages full of fight and Save the day by defeating Forever King and Rojo! Good Luck! Don’t Forget to give your rating for Ben 10 Big Battle Game and share your tips and tricks to win this game in the comments section below.